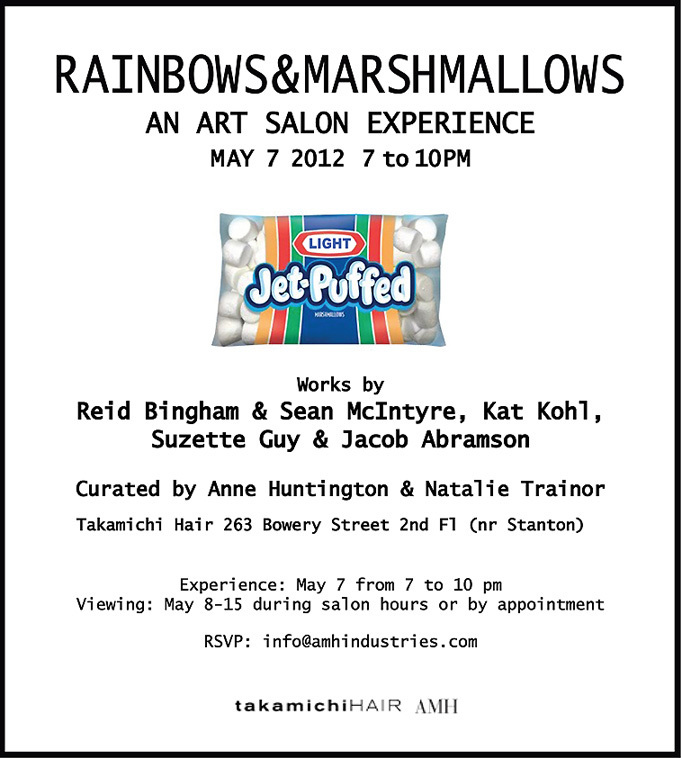 Announcing Rainbows & Marshmallows – an interactive salon experience with installation and digital performance works by Reid Bingham & Sean McIntyre, Kat Kohl, Suzette Guy & Jacob Abramson, curated by Anne Huntington & Natalie Trainor at Takamichi Hair on the Bowery. Join us May 7 to experience the lights come to life with live LED painting, colorful photo-booth innovation, cavernous sculpture and digital graffiti. The salon experience will entice and excite the senses with fleeting and lasting marks creating dialogue with the Bowery and its surroundings using windows, walls and buildings as canvas, expanding mediums from performance to portraiture and toasting the evening with cocktails and marshmallows. After the bright rainbowed lights, digital tags and geometric sculpture at the favored downtown salon experience, Takamichi Hair, the Danish restaurant, Vandaag will provide an after party continuing the downtown lit conversation. Curators Huntington & Trainor collaborate with acclaimed stylist Takamichi Saeki to dream up an interactive innovative experience blending art, hair and all that the Bowery has to offer. Reid Bingham & Sean McIntyre are the creators of the Rainbow Tracer, stating: regardless of [a rainbow’s] significance, everyone enjoys finding a rainbow in their day … unfortunately; most rainbows do not photograph well.” The Rainbow Tracer works magic – making rainbows come to life through photography. Kat Kohl’s sculptural works play with the form and function of light and line, complementing, creating a sculptural light reflection. Kohl recently completed the Gulkistan Residency in Iceland. Jacob Abramson & Suzette Guy’s digital graffiti creates cutting edge multi-media art installations where the mission is to communicate new perspectives through a digital medium internationally. Anne Huntington is an art curator and advisor based in NYC, the founder of AMH Industries – the creative agency for contemporary culture. Natalie Trainor is an independent curator, consultant, and artist manager living and working in NYC. Takamichi Hair first opened its doors in NYC in 2000, recently moving the salon to the Bowery in fall 2011. Bringing versatility to styling through a focus on the individual and the love for the craft of a good haircut, Takamichi Hair holds true to their philosophy: an individual experience leads to an exceptional haircut.